Figs are not something that appear on my table very often, and the reason surely must be because the fig season seems so dearly short. 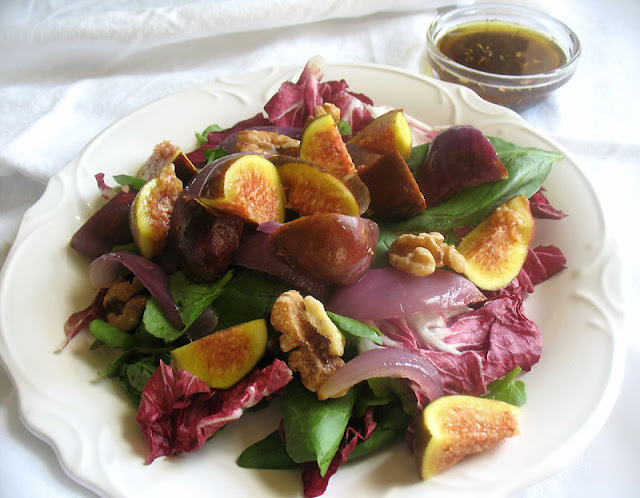 It is certainly not about the sweet and unique taste they contribute to dishes, especially salads such as this balsamic dressed one with bitter radicchio, fresh basil and peppery watercress. 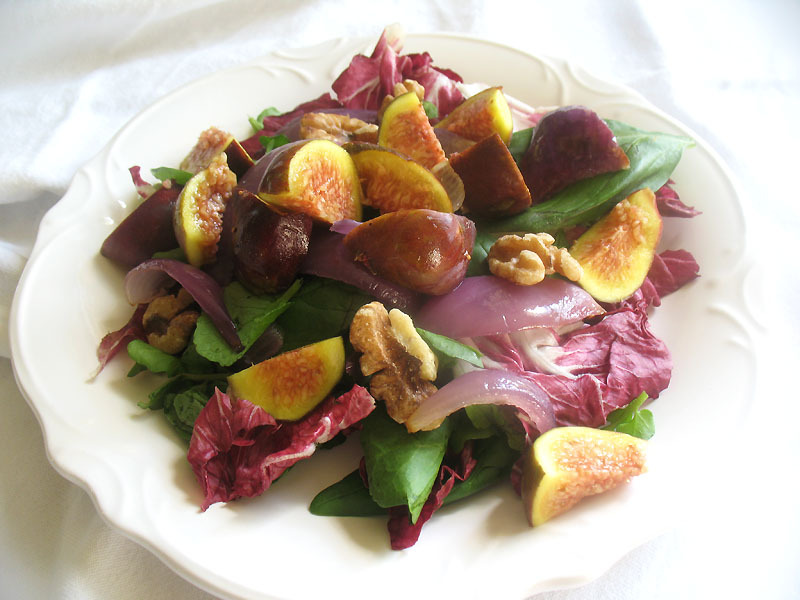 This is a bold salad that can be enjoyed year round as a bit of hunting in even modest size cities will result in figs to adorn this dish. In this case, these figs were imported from Israel and I had no reason to complain about freshness, despite the fact they were imported from overseas. This recipe is inspired by one of my latest cookbook acquisitions. Plenty More: Vibrant Vegetable Cooking is a follow up to Plenty by Yotam Ottolenghi. 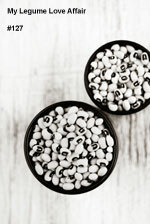 Both books are vegetarian and feature stunning creations that are for the most part easy to make and always delicious. I enthusiastically display a few of Ottolenghi's beautiful books on my shelf, and although the other two books are not strictly vegetarian, there are plenty of offerings for vegetarians and vegans within the covers complete with photos that tempt one to preserve the books as coffee table browsing. That would however be a shame because the recipes deserve to be explored in the kitchen and served up at the table. 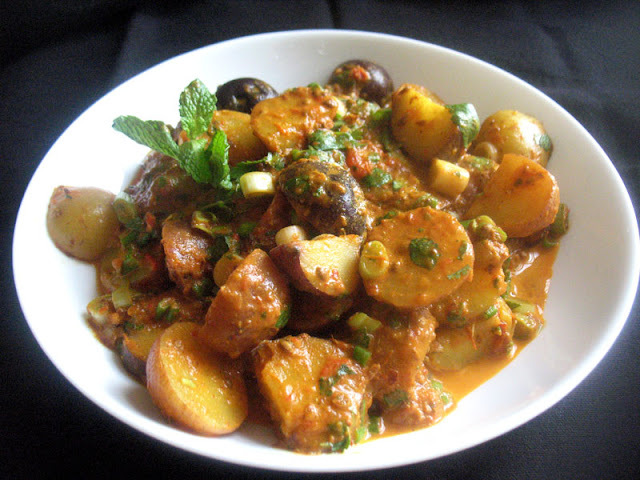 Impressive, always, with middle eastern flare and loaded with plenty of vegetables. Preheat an oven to 425°. Peel the onion and halve lengthwise, then cut each half into wedges. Toss the wedges with 1 1/2 teaspoons of olive oil, a bit of salt and some black pepper. Transfer to a baking sheet and roast in the oven for 20 to 25 minutes, stirring at least once during roasting, until the onions are soft and golden and just begin to turn crispy on the edges. Cool and separate the onions into bite size pieces. Set aside. Meanwhile, toast the walnuts in a small unoiled skillet over medium-low heat for 6 to 8 minutes, tossing frequently, until lightly toasted and fragrant. Set aside. Mix together the radicchio, basil and watercress. To make the dressing, whisk together the oil and vinegars, cinnamon, herbs, and salt and black pepper to taste. Taste and adjust. 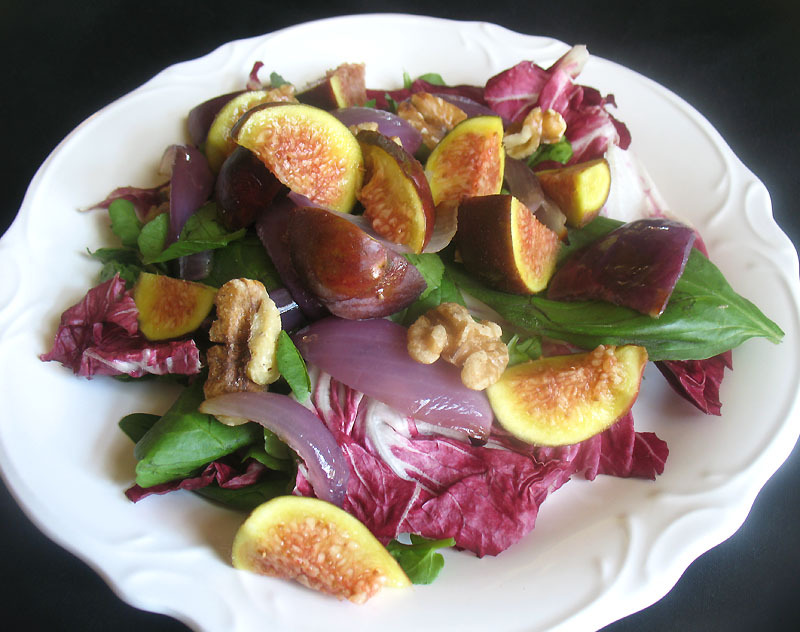 To assemble the salad, arrange some of the mixed radicchio, basil and watercress on plates. Top with a few pieces of fig and some roasted onion. 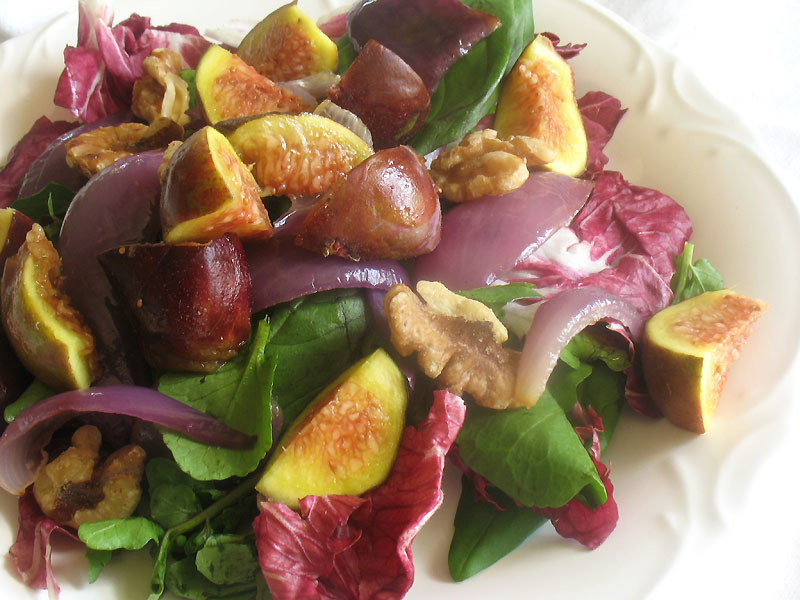 Add a few more leaves to the plate, along with more fig and onion. Drizzle some dressing over the salad and garnish with some walnuts. This is my submission to Bookmarked Recipes, hosted this month by Fuss Free Flavors and administered by my dear friend Jacqueline of Tinned Tomatoes. I'm also sharing with No Croutons Required, a vegetarian soup and salad event alternately hosted by Jac and myself. I'm hosting this month. I adore figs and this immediately caught my eye in Plenty More. Too bad they're not still in season! Looks great. I haven't tried anything yet from it but the cookbook sounds delicious, as always!